Here is a diverse compilation of current knowledge in public mental health marketing. 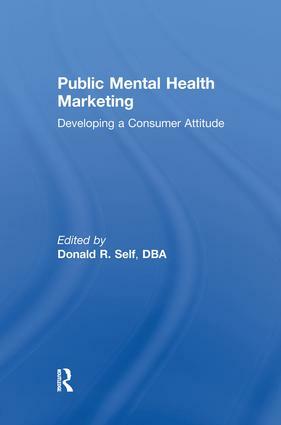 A balanced collection of both research and how-to chapters, Public Mental Health Marketing helps practitioners and researchers learn to target specific groups more effectively, increasing their marketing effectiveness to benefit both mental health agencies and the people they serve. It presents a cross section of recent research on the many participants in the mental health system, including clients, donors, internal stakeholders, and the general public. Over a dozen chapters focus on the marketing of local, state, and national mental health agencies and their relationships with their various clienteles. This helpful book contains original research, tutorials, and case studies in areas such as the public as a target market, primary and secondary consumers’views of the system, referral and secondary resource markets, adolescents as a prevention and intervention market, and promotional and evaluative tools. Learn about the principles of marketing as they relate to mental health professionals; the use of fear appeals in public service announcements; building a marketing environment in community mental health settings; an analysis of changes in the marketing of mental health products to government, business, and industry; and strategies to identify and reach adolescents at risk for drug and alcohol abuse. Public Mental Health Marketing also contains abstracts for nearly one hundred recent articles and monographs that are useful to researchers and practitioners of marketing in the mental health field. Public information and public relations officers in local, state, and national mental health agencies, and academic and public policy researchers from both the mental health and marketing disciplines will find the information they need to increase the effectiveness of their work.